Inverary Castle, Scotland. Photographic Print of Inverary Castle - Argyll, Scotland from Ardea . 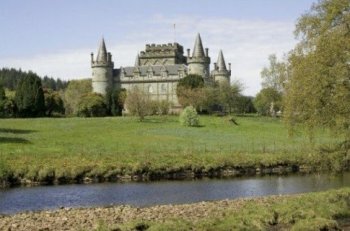 Inverary Castle, the seat of the Dukes of Argyll, is haunted by "The Harper of Inverary", who was hanged by Montrose's men on the site of the castle before it was built. His music has been heard and he has been seen in various parts of the castle, including the Green Library, and on the stairs. He always wears the Campbell tartan and never seems to harm or frighten people who see him. He is normally seen and heard by women, very rarely men. Before the death of a chief of the Campbell Clan, or a near relative, a ghostly galley, bearing a strong resemblance to the ship on the Campbell's' coat of arms, is seen on the Loch, with three spectral figures on board. It is said to pass up the Loch and then disappear overland. Inverary Castle was once the scene of a martial vision during the fighting in North America between the British and the French. Sir William Bart, a noted doctor of his day, was walking with a friend in the grounds on 10th July, 1758, accompanied by a servant. Suddenly, he and his two companions saw the enactment of a battle in the sky in which men in the uniform of a Highland Regiment appeared to be attacking a fort defended by French troops. After a short fight, they were to witness the Highlanders retreating, leaving behind them a large number of dead. The same scene was simultaneously witnessed by two ladies on the road to Kilmalieu. Weeks later news came from Canada that on that same day a British force of 15,000 men, under General Abercromby, had attacked the French fort of Ticonderoga, held by the Marquis de Montcalm, and after a bitter action had been forced to withdraw leaving behind 1,994 dead. In this action, the 42nd Regiment Black Watch lost half of it's men, including 25 officers killed or wounded. Inverary Castle, Scotland. 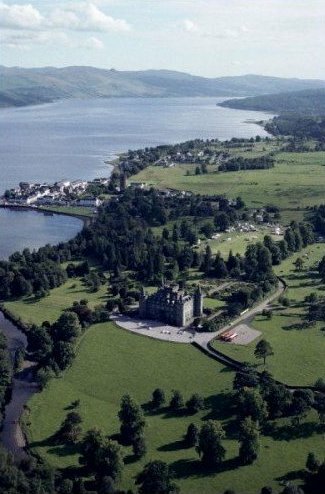 Photographic Print of Aerial view of Inverary castle and Loch Fyne from Robert Harding . On a warm and sunny day in 1765, a farmer and his son walked from their home in Glen Aray to neighbouring Glen Shira, where both had business to attend to. As they walked over the hills on their return journey they decided to walk home the longer but easier route through Inverary. They had just turned northwards when they were astonished to see a great number of soldiers marching in regular order towards them. Both farmer and son watched the marching columns for a considerable time, marching six and seven abreast. The rear ranks were observed to be continually running forward in order to catch up with those in the front of them. The farmer remarked at the time that this invariably happened on a long march and advised his son that should he ever join the Army he should always volunteer for the front ranks, where the pace was always that much more leisurely. Accompanying the soldiers were women and children on either side, carrying pots and pans and other items of culinary. The soldiers were clothed in red and the sun was seen to gleam on their muskets and bayonets. They were led by an officer on a horse, the only mounted man in the large convoy. He was wearing a gold-laced hat with a blue Hussar jacket, boots and spurs, and was riding a grey dragoon horse. The father, who had served with the Argyllshire Highlanders twenty years previously and had actually fought at the Battle of Culloden, said that the troops must have come from Ireland and were probably on their way to England. In his experience he had never seen such a large army and estimated the number to be far greater than the total combatants at the decisive battle in 1746. Both men watched for a considerable period of time until the younger man, fearing possibly that he might be taken with them if he remained in view, climbed over a stone wall to hide. The older man, being far too old for military service, had no such fears and remained watching the endless convoy of Redcoats. Then suddenly the army vanished. Both men were completely astounded at the sudden disappearance of such a large body of men. On their way home they met an old man called Stuart, from Glen Shira, an old friend of the farmer. They asked him if he knew what had happened to the mysterious army. The old man was startled at the question because, although the army must have passed him, indeed it had not. No other person had seen the phantom army and there was no record of any troop movements of such a large number of men in that area at that time. Both men were regarded as being totally honest and incapable of telling a lie. They had both only drunk milk that day.